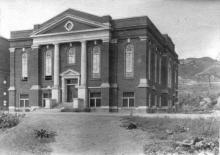 The First Congregational Church on E. Quincy St., replaced one located on Quincy & Tezcucco that burned down in 1917. This church broke ground in 1919, and opened for services in 1921. It was located in the same block as the Kerredge Theatre, and was on the NW corner of Dunstan & E. Quincy St. Photo 1 shows the building as it appeared not long after completion, in the 1920's. Photo 2 shows the church in the mid 1950's. Note the Kerredge Theatre to the left. 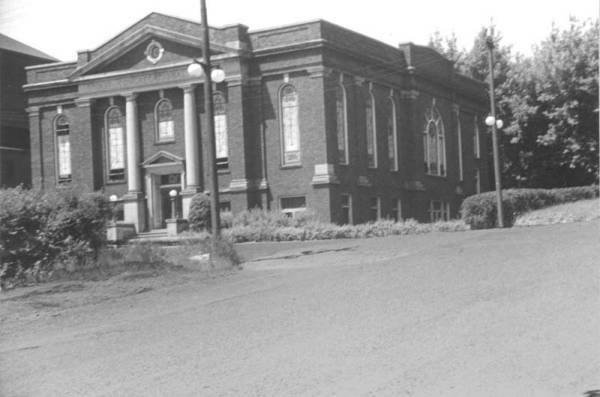 After the congregation merged with the Presbyterian Church of Houghton, the building, now vacant for several years, was torn down in the summer of 1969.